The AED Trainer 3 is configured with eight real-world scenarios that have been developed in accordance with internationally recognised responder programmes. Many parameters on each scenario can be easily configured to conform to local protocols or future Guideline updates. Language voice prompts can also be changed at a touch of a button. The Philips AED Trainer 3 Remote gives instructors the ability to quickly override the AED Trainer 3 at any moment providing the means to test how students respond to a variety of situations. The Philips FR3 Training Pack is an accessory that can be used with you Philips HeartStart FR3 AED (models 861388 and 861389). 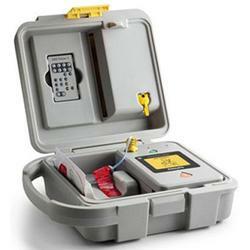 The Training Pack allows you to convert your AED above into a non-shocking training unit.